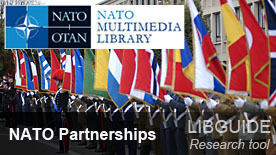 This LibGuide is intended to provide a few starting points to assist you with your research on issues related to NATO partnerships. The Allies seek to contribute to the efforts of the international community in projecting stability and strengthening security outside NATO territory. One of the means to do so is through cooperation and partnerships. Over more than 25 years, the Alliance has developed a network of partnerships with non-member countries from the Euro-Atlantic area, the Mediterranean and the Gulf region, and other partners across the globe. NATO pursues dialogue and practical cooperation with these nations on a wide range of political and security-related issues. NATO’s partnerships are beneficial to all involved and contribute to improved security for the broader international community. In the Euro-Atlantic area, the 29 Allies engage in relations with 21 partner countries through the Euro-Atlantic Partnership Council and the Partnership for Peace – a major programme of bilateral cooperation with individual Euro-Atlantic partners. Among these partners, NATO has developed specific structures for its relationships with Russia, Ukraine and Georgia. NATO is developing relations with the seven countries on the southern Mediterranean rim through the Mediterranean Dialogue, as well as with four countries from the Gulf region through the Istanbul Cooperation Initiative. NATO also cooperates with a range of countries which are not part of these regional partnership frameworks. Referred to as “partners across the globe”, they include Afghanistan, Australia, Colombia, Iraq, Japan, the Republic of Korea, Mongolia, New Zealand and Pakistan. 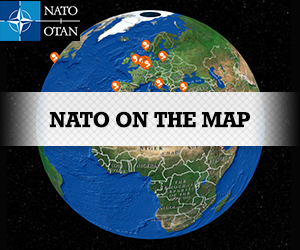 Discover NATO member and partner countries and locate them on the map. Explore this interactive map to discover how NATO works and how it responds to today’s security challenges.